For those who may not yet know, I am the latest addition to the Hazel Tree family. During my interview, it was explained that the position was one which would entail many responsibilities and that these would literally be determined from one day to the next and that I would, in essence, need to be their Guy Friday. We all laughed and then it was suggested that this could be my job title. I am not well-versed in Daniel Defoe’s classic, Robinson Crusoe, but I know enough about it to know that I – like Friday - am fiercely loyal and can be handy in a pinch. I’m also self-aware enough to know that I’ve never ever been one to balk at flouting convention, so I very nearly jumped out of my chair to say “YES.” Fast forward a month or so and here I am writing a blog post about Hazel Tree’s recent visit to Derby Downs and the Soap Box Derby Museum. One of the most recent responsibilities bestowed upon me is organizing the curated artifacts which are being donated for use in the Generator, which occupies the first floor of Bounce Innovation Hub. These artifacts will be displayed to help remind all who visit and work there that innovation and creativity have always been Akron hallmarks and that even though Akron is rapidly moving forward in the 21st century, there are a handful of cultural and historical pillars which continue to support our city and our collective identity. 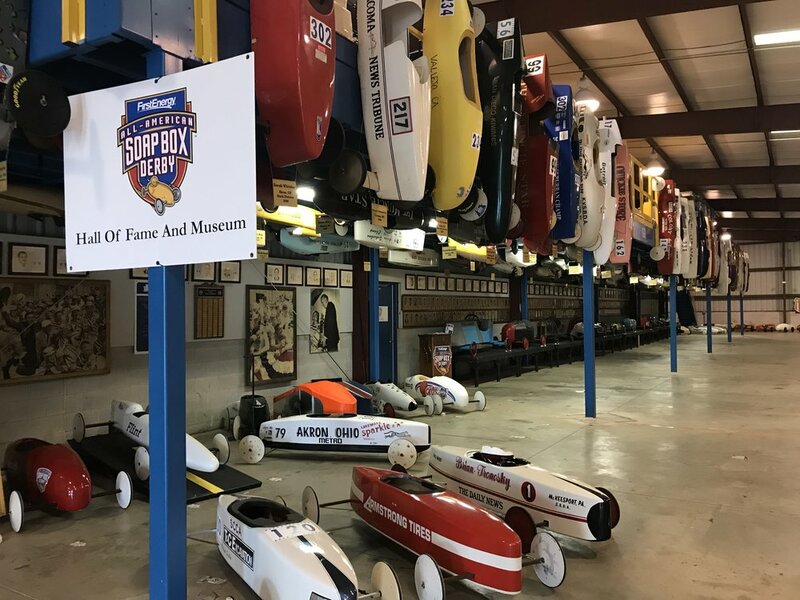 The first of these local icons to provide artifacts is the Soap Box Derby. While we were at the museum to pick these up, they gave us a quick tour. We learned about the long and storied history of the event, the evolution of the derby cars, and the most recent winners and record holders. We found out that the 40th anniversary of the first female winner recently passed and got to see the car she rode to victory in 1974. They also showed us the car that they are donating and, on our way out, generously handed over a veritable treasure trove of material: a giant box of press clippings, wire and publicity photos, and design manuals. We are incredibly honored to have received these and look forward to finding just the right artifacts to showcase the Soap Box Derby’s place in Akron history and to help spur creativity in the Generator workspace.